How Alive Are You Willing To Be? My life is littered with a trail of failures. I’m not talking about breadcrumbs here. I’m talking about a cement truck with a very pronounced leak. I have career failures, personal failures, literary failures, artistic failures. Projects that were never “successful” in the eyes of “the establishment.” My books have been rejected for being “too literary” and for being “too different.” A student wrote me recently to tell me that my work was flat and one-dimensional. One of my friends has not been able to finish one of my books because she finds it boring. My music was rejected for years without the courtesy of explanation. I’ve been rejected my countless potential paramours for being “too much.” I’ve been ignored and forgotten by friends and paramours and even by family. I have shown my photographs in countless bars and nightclubs, magazines, websites, and even galleries, but I’ve only sold two prints in my entire photographic career. One of my books sold 10,000 copies, and I still can’t find an agent or anyone to publish my fiction. I got rejected from all the Phd programs to which I applied the first time around, and I got rejected from two this latest time. When I applied to UCLA the first time, one of the senior faculty even told me (to my face) that I was wasting my time and hers by applying. It took my five years of steadily sending out query letters about my Office Killer book before a publisher finally said yes. When I left NYC for Berlin in 2003, I told a friend that I was leaving because I had failed in NYC. NYC didn’t want me. I’d spent years working to get gigs for my band, struggling to get people to pay attention, and it never stopped feeling like trying to get blood from a stone. At the end of the day, I felt like no one cared. There was always so much resistance and I didn’t think that would ever change. But my friend told me that I hadn’t failed. That careers are built over a lifetime. That one isolated “failure” may just be a fork in the road sending you down the correct path. It’s easy for me to forget that. My first two terms at UCLA, I felt in constant fear that people were going to figure out that I didn’t belong there. That somehow I’d faked my way in. That I’d constructed a particularly effective smoke and mirrors campaign but soon the air would clear, and I would be exposed. I’ve always felt acutely aware of the gaps in my knowledge, of the lapses in my memory. I’ve never felt particularly smart. I’m observant, and I can be good at drawing connections between things — I live for drawing those connections — but if you asked me what year Pollock’s profile came out in Life magazine, I wouldn’t be able to tell you, and I teach Contemporary Art History. If you asked me what year the Vietnam war began (or ended), I wouldn’t be able to tell you. I’m horrible at math. I can’t ever remember what Derrida said or what Foucault argued. If you asked me how much money I’ve made off my photographic career, I could tell you. 300 euros. If you asked me how much money I’ve made off my publishing career over the last eight years, I could tell you. Not enough to cover a flight to NYC. If you asked me how it feels every time I start a new paper, I could tell you. Total fear and panic. I’m never going to be an accountant. I can’t live in a cubicle. I just can’t do that. I don’t even know if I could go back to a corporate career. What life would be worth living if you didn’t do what you wanted to do — or at least tried? Without new experiences, we grow stagnant. Without challenges, we grow boring. And let’s not even get into the regret of avoided opportunities. Unfortunately, challenges often equate to panic, self-doubt, and potential failure. You have to ask yourself — how alive are you willing to be? And then you have to step out on that ledge and take the plunge. 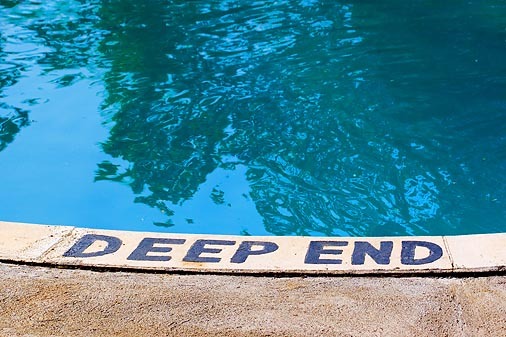 It might be safer to stay in the shallow end, but can you really spend your life there?